I can't believe it is almost time for this race again. 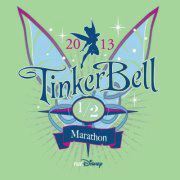 The 2012 Tinker Bell half marathon was a very important race for me last year. It was the first race of my deployment challenge to myself, and completing it was the start of a whole new phase in my life. This year is quite a different story from last year. Last year I was so nervous, it was only my second half marathon and I was still very nervous about not being able to finish in time. This year I feel so much better prepared and I do not have doubts about being able to finish this race within the time allowed. This time, I am doing this race with Team in Training and I am heading out early Friday morning to California. I will get to meet up with some of my TNT flex team on Friday. I also plan on hitting up the expo on Friday- runDisney expos are great- so much fun stuff to check out! Saturday I volunteered to work a shift for Sparkle Skirts, I will be there from 10 am- 2 pm, if you are there, please stop by and say hello :). Saturday evening is the TNT inspiration dinner and then Sunday is the big day! The race starts at 5 am- thank goodness it is on the west coast- it's so much easier to get up for those early races out there! I plan on sticking with my 2:1 run:walk ratio for this race, I've been training at that ratio for the past couple of months so I am hoping that will help me with a new PR for this race (current PR is from the Wine and Dine in November). In other news- I am still on track with meals cooked at home for this month and also keeping up with my Moon Jogger miles- I'm looking forward to adding those 13.1 miles to the total next week :). In order to keep up with my goals, I am planning to meal plan for next week early so that I don't miss out on any days. I found out last year that planning ahead is key! So, anyone else running Tink this year? I was there for Tinker Bell too!